Would Alteryx please consider putting a "notes" page for gallery apps. This would help the developer of the apps give notes and "how-to's" to the users. You can actually add URL pointing to a document to each app that the user can reference when they select the app. 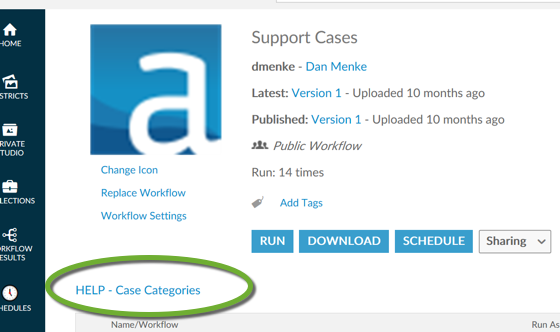 In the workflow you can go to the Workflow Configuration and the MetaData tab. You will see a section that has URL and then a display name. You can create a document and have that URL reference a "how to" or "help"document. Hey @DanM - is there any embedded capability to do comprehensive documentation within the gallery? The URL method you mentioned above can point out to a sharepoint or confluence page - is there an existing capability to hold detailed notes on a flow within Gallery that then flow to Connect? @SeanAdams right now it is just the workflows that get posted in Connect. I like the idea though! I think it make perfect sense to display that to the user on Connect so they know what the workflow does and how to use it. Would be good to add to the Connect Ideas.